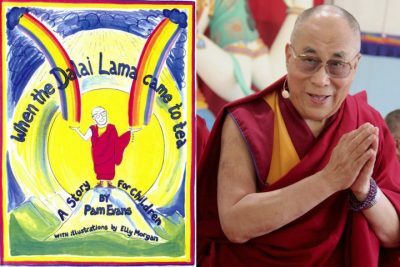 February 7, 2019 0 comments on "Pam Evans is Interviewed about When the Dalai Lama Came to Tea"
Pam Evans’ new book ‘When the Dalai Lama Came to Tea’ is a delightful book for children, illustrated by Elly Morgan. It introduces the Dalai Lama and spirituality to a young audience through storytelling and the book has His Holiness’s approval and blessings. The Sunday Tribune spoke to Pam Evans about her new book. TST: Tell me about your new book ‘When the Dalai Lama Came to Tea’. Pam Evans: “This little story came out of the most astonishing dream I have ever experienced. I rarely remember my dreams, so this was especially unusual and very startling. It was during the summer of 1993 when I had been walking in the mountains of Snowdonia, North Wales with an old college friend. She’d told me that the mountains possessed great power because they’d existed long before human beings and that by walking in them, we would receive some of their energy. I didn’t think much of what she said at the time – she often said unusual things. We were staying at the old school house in Llanrug, not far from Caernarvon. One morning I woke shortly after dawn with a dream so vivid that I almost leapt out of my bed- The Dalai Lama had visited my mother’s home in Gorseinon, South Wales and the most extraordinary things had happened. That my deceased father and uncle were also in the dream added to the strangeness. Most astonishing of all was the levitation! I waited until my friend woke, then knocked on her bedroom door. When I told her about my dream, she looked at me as if I was mad, then burst out laughing. Immediately something told me to ‘not let go of the story’ but to use it and write a story for children. I also realised that I would somehow have to get it to His Holiness (The Dalai Lama) for his approval. Immediately after breakfast I asked my friend if she could find some scrap paper and a pencil and leave me…which she did. TST: The illustrations are a delight; can you tell me about the artist? PE: “When I returned to school in the September, I approached Elly Morgan who was Head of the Art Department in the comprehensive school where I taught. I told her what had happened. Elly was deeply spiritual and a lovely person. She explained that her medium was glass and ceramics, not fine art or drawing and painting, and that maybe I should find someone else. I asked her if she would please read the story anyway and see how she felt. Three days passed and she said nothing. I thought that perhaps she didn’t like it. Then she came dashing to me in an excited state, said she’d sat under the large tree in her garden to read it and that she’d be delighted to give it a go. She asked me for some photos of His Holiness and anything on Tibet that would help her get a ‘feel’ for the drawings. She made one request; that she could draw His Holiness arriving in a Beetle Volkswagen (She was a huge fan of them). I said, “Of course – but it must be yellow and open top!” I have no idea why I said that. TST: What inspired you to write this book? TST: There is an element of magic to it, welsh magic, I should add, and you make a connection between Wales and Tibet, two very magical countries, can you comment on that please. Pam Evans: “Yes, this is magical. Anyone who has studied the history of Tibet will also be aware of the incredible magic of esoteric Buddhism and the stories of Guru Rinpoche (Padmasambhava). In Wales there is also a lot of magic in our legends, the stories of the Mabinogi, Merlin, and the Druids who were the ancient priests of our past. Who knows what actually happened to me in the mountains of Snowdonia and the astral dream world I entered on that unforgettable morning? Roald Dahl said, “Those who do not believe in magic will never find it”. Well I think I found some magic with this. One thing about Elly’s drawing for the book cover that really strikes me are the rainbows reaching down to the hands of His Holiness. I did not ask her to do that. It’s amazing that years later, the double rainbow design for the Peace Mala bracelet came to me in the aftermath of 9/11 and His Holiness was the first person to endorse the concept and vision of this project for world peace! Within months of receiving the letter form HH secretary, Lord Ennals (now deceased) and Joanna Lumley showed enthusiastic support for the book’s publication. This little book for children received the blessing of His Holiness, The Dalai Lama to publish. When I was still teaching, I used the book with my Year 7 pupils who loved it. All proceeds go to Peace Mala.